Something for the kitties! 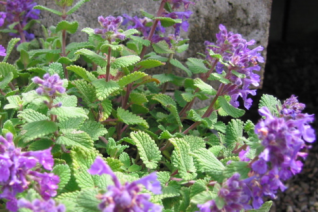 Beautiful form of catmint with rounded, and quilted sage green foliage and clusters of violet blue flowers held in a little deep purple calyx. Massive bloom in May and June, shear off spent flowers and water and wah lab a new batch of sublime blue erupts quickly. Full sun and rich to average well drained soil. In our climate it shuns dry heavy clay so drainage is an issue. Forms a clump that spreads considerably. To 2′ x 2′ in an average season. Light consistent summer moisture. Completely winter deciduous. Loved by cats who consume and then laugh and laugh.